BUENOS AIRES, Argentina — All eyes will be on Antonio Watson as he shoulders Jamaica’s hopes of adding its second medal at the 2018 Youth Olympic Games in Stage Two, Heat Three of the boys’ 200m today, beginning at 4:25 pm here (2:25 pm Jamaica time). Watson, with the second-fastest time of 21.33 seconds, will enter what is essentially the final, Stage Two, Heat Three, with the fastest qualifiers in chase of Qatar’s Abdelaziz, who won his heat in a personal best 21.10 seconds. 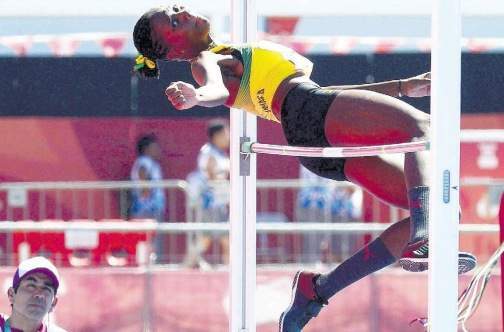 The Jamaica Olympic Association (JOA) sent a 12-member team to represent the country at this, the third edition of the Youth Olympics, where Ackera Nugent won its first medal, in the girls’ 100m hurdles on Sunday. Petersfield High’s Watson already has the World Junior Championship 400m title and is motivated to win the double. “I can go a lot faster … 21.3 wasn’t bad, when the final comes I’ll put it all out there on the track,” said Watson, whose (personal best) PB is 20.90 seconds. Jamaica’s medal hopeful today, boys’ captain Shanthamoi Brown, races in Stage Two, Heat Two of the 400m hurdles with the fastest qualifiers. The event begins at 4:50 pm (2:50 pm Jamaica time). Brown has the eighth-fastest time, 53.87 seconds. With a PB of 52.16, to get a medal the Kingston College student will have to perform exceedingly well and hope others ahead of him run poorly. Japan’s Haruto Deguchi leads all qualifiers with 51.40, followed by South Africa’s Lindukuhle Gora, 51.70, and Hungary’s Daniel Huller, 51.98. Apolos Edwards will also close off in the boys’ triple jump which starts at 2:05 pm (12:05 pm Jamaica time). The Jamaica College jumper enters the event in 11th following a first-round effort of 14.99m, which is close to his PB 15.05m. Cuba’s Alejandro Diaz leads with 17.14m. Meanwhile, Michali Everett went close to winning a medal yesterday in the boys’ Stage Two, Heat Five 100 metres finale. Everett, who started the day at fifth, placed fourth in 10.44 seconds for an overall finish of fourth with a combined time of 21.38. The Jamaican’s medal effort was largely undone in Stage One, when he won his heat in 10.94 seconds in blistering cold on Saturday. Monday afternoon brought conditions that were more homely and Everett, running in lane seven, got close to his personal best, 10.42. South Africa’s Luke Davids won the event and gold in 10.15 seconds and a combined 20.71. Silver went to Nigeria’s Olukunle Akintola, 10.24 (21.00), while Japan’s Seiryo Ikeda claimed the bronze medal in 10.30 (21.12) seconds. “I went out there and did my best. Right now I’m feeling good because I finished fourth overall. I went out there and did my best to make my country proud,” said Everett. “I feel bad, but it’s God’s will, everything happens for a reason. But I’m still proud,” he said. Danielle Sloley also started among the finalists yesterday, in the girls’ shot put, at eighth position with a level 15-metre best throw from Stage One. The Immaculate Conception High thrower improved her best effort to 15.16m, within range of her PB 15.99, to place ninth overall with a combined 30.16m. China’s Xinhui Li threw 18.33m (36.75m overall) to claim gold. Jamaica’s three other competitors also improved their mark. Shantae Foreman cleared 1.76m in Stage Two of the girls’ high jump, placing 11th on the day and 13th overall with a combined 3.41m, following her 1.65m effort in Stage One’s bitter cold. Ukraine’s Yaroslav Mahuchik cleared 1.95m (3.87m) to win gold. In the boys’ long jump, KC’s Shacquille Lowe leapt 7.22m to place seventh, and ninth overall with 14.05m. Cuba’s Lester Lescay won with 15.54m. Kimar Farquharson better represented his talent with a 1:52.09 clocking in the boys’ 800m to place 16th overall of the 25 entrants. Farquharson’s time would have placed him seventh in yesterday’s medal race, a tight one won by gold medallist Tasew Yada of Ethiopia in 1:50.38 (3:39.76 overall).